Optimum Gold Standard Gainer is a dietary supplement with high-quality proteins, fats and carbohydrates in optimum proportions. The formula contains wholesome sources of protein only and a blend of complex carbohydrates (from oats, potatoes and peas). It has been also enriched with fats from flaxseed, chia and MCT. As commonly known, a well-balanced diet is essential to maximise your gain in muscle mass. It is said that a proper diet is 80% of your success. Unfortunately, it is very often difficult to provide an optimum amount of nutrients only from diet. To build muscle mass, proteins are not only essential but also fats and carbohydrates. A deficiency of just one of these nutrients may slow down your progress which may not happen at all. High-calorie nutritional supplements do not only solve this problem but are also very convenient to prepare. Due to the content of high-quality protein, fat and carbohydrates, it can be helpful when building mass. It may be also used as a post-workout nutritional supplement to replenish essential macronutrients. 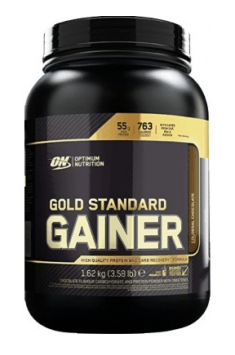 To sum up, Optimum Gold Standard Gainer defines a high standard for building mass. The formula is designed for all individuals who struggle with gaining mass and also value high quality of ingredients. Mix 1-2 scoops of Gold Standard Gainer in 10 - 20 fl oz of milk or water 30 - 45 minutes following exercise to support maximum recovery or 45 - 60 minutes before bed to help muscles recover while you sleep. Mix up 1 scoop of Gold Standard Gainer between meals to help support a high-calorie diet. It is assumed that the best time for using the gainer is just after your workout. The nutritional supplement may be consumed when your body needs food and we cannot prepare it. It may be used also when the break between meals is longer than 4 hours. In this case, take a proper dose of the supplement preferably in the middle of this break. Such nutritional supplement is aimed at increasing caloric restriction. However, it is not a meal replacement and should not be overdosed. It may be also added in an optimum amount to meals, e.g. omelettes and pancakes to enhance their taste and increase caloric value. Protein Blend [Whey Protein Isolate, Whey Protein Concentrate, Milk Protein Concentrate, Hydrolysed Whey Protein Isolate, Emulsifier (Soy Lecithin)], Quality Carb Complex (26%) [Oat Flour (GLUTEN), Potato Starch, Pea Starch), Maltodextrin, Fat-Reduced Cocoa Powder, Medium Chain Triglyceride Powder, Flavourings (Milk), Ground Flaxseed, Thickeners (Xanthan Gum, Guar Gum), Sodium Chloride, Sweetener (Sucralose). Contains Milk.